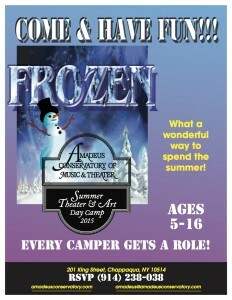 The Amadeus Theater & Art Day Camp gives children ages 5-16 the opportunity to perform in a musical adaptation of FROZEN – Really Frozen!! !, play group outdoor sports and games, study band or orchestra instruments, piano, guitar and voice, paint and create sets, learn choreography, play in a jazz percussion, rock or chamber ensemble, compose their own songs, create studio art, learn photography and film-making, participate in an art show, and go on a swimming field trip. Camp culminates in a fully staged theater performance in a professional theater. Six weeks, one to five week sessions available. Camp is held in Chappaqua: 201 King Street, Chappaqua, NY. June 29 – August 7, M-F, 9:00 – 4:00. Preschool music program, Sounds of Music, also available. Visit www.amadeusconservatory.com or call 914-238-0388. 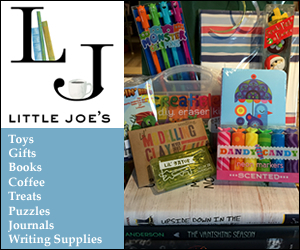 Bedford Hills Free Library: Summer Story Times at the Bedford Hills Free Library start July 7: Tuesdays at 10:30 a.m., Laptime for Pip Squeaks with Rachel Izes, ages 6 – 18 months; Tuesdays at 4:15 p.m., Read More Three’s & Four’s, with Vicki Kriegeskotte, ages 3-4 years; Wednesdays at 10:30 a.m., Little Folks and Friends with Rachel Izes, ages 18 months-3 years. Wacky Wednesday program series with Special Guests starts July 8 and ends August 12, ages 5 years and up at 4 p.m. . Summer Reading Game June 29 thru August 14. Please check website calendar for other events and last minute changes: bedfordhillsfreelibrary.org or call: 914.666.6472. Independence Day Fair at John Jay Homestead, Katonah NY. 4th of July 2015 family fun begins at the John Jay Homestead at 110 a.m. with the Independence Day Fair featuring barbeque and refreshments for purchase, reading of the Declaration of Independence, music, log sawing, Revolutionary horseman George Washington and Col. Humphries, house tours, bird house building, petting zoo and horses, blacksmith, pony rides, hayrides, crafts, beekeeping, art display discovery center, colonial games, and many more activities throughout the day. This event is sponsored by John Jay Homestead and the Bedford-Armonk Rotary Club. The address is John Jay Homestead State Historic Site, 400 Jay Street, Katonah NY, 10536, and website is www.johnjayhomestead.org. To reach the Friends of John Jay call 914.232.8119 or email friends@johnjayhomestead.org. A farmers market starts the day at 9:00 a.m.
Join us for a morning of non-stop fun Jodi’s Gym style! Your child will run, jump, tumble, balance, stretch, sing, create, move and groove all under the supervision and care of our well trained and certified staff. Come experience the joys of gymnastics, music and art. It’s a mix that your child is sure to love. Jodi’s Gym camp is offered all summer long (right up to Labor Day!) We offer super flexible scheduling. You register for the days and weeks that work for your schedule. Ages: 3-7 yrs, Dates: 6/15-9/4, Time: 9:30-12:30, www.jodisgym.com, Jodi’s Gym, 25 Hubbels Dr., Mt.Kisco, NY 10549, 914.244.8811. Saturday and Sunday, July 25 and 26, 12:00 – 4:00 pm. Young and old experiment together as they enjoy food-based art activities throughout the KMA’s campus: potato printing, edible art, and inks made from discarded food. Learn about the cycle of food production, consumption, and waste. Free with Museum admission. Bring a non-perishable packaged food item for the Community Center of Northern Westchester Food Pantry and receive $1.00 off admission. Katonah Museum of Art, Katonah. Please consider giving the gift of mobility and independence! Can you spare some time to make a difference in the life of an older adult in our community? RideConnect, a non-profit program of Family Services of Westchester, is seeking volunteers to help drive older adults to a variety of activities: shopping, medical appointments, religious services or other errands in Westchester. These rides enable older adults to remain active in their communities and to continue to lead fulfilling lives. RideConnect asks that volunteers be able to provide one ride per month. Call Karen Ganis at (914) 864-0955/email kganis@fsw.org or Marietta C. Manoni at (914) 864-2036/email mmanoni@fsw.org.